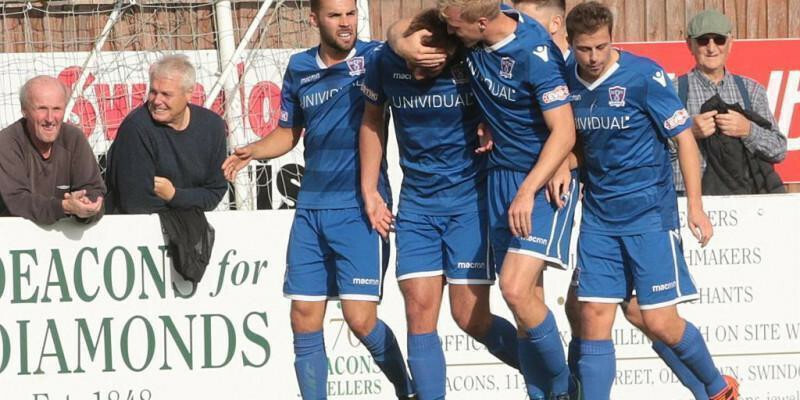 Supermarine can count themselves unlucky to not get their first home league win of the season after missing a number of opportunities against top-of-the-table Weymouth at The Webbswood Stadium. Jerel Ifil made his league debut, whilst Connor Thompson, who was recalled from his loan at Fairford, and Joe Shepherd returning from bruised ribs, were also both in the starting line-up as manager Lee Spalding went with a more familiar 4-4-2 formation. Marine started the game on the front foot and took the game immediately to their high-flying opponents. The game’s first chance resulted in a goal ten minutes in. Bradley Gray showed some great skill down the right hand side to create some space for a cross that he swung in beautifully for Conor McDonagh (click to view the goal) who worked into the open space to head back past Jordan Seabright to score his 6th goal of the season. Two minutes later it should have been two as Stuart Fleetwood got in behind his former team’s back four but took one too many touches before dragging his shot wide across the face of goal. Weymouth were unlucky to not score shortly after as the ball pinballed all around the home box with several shots blocked and saved before eventually it found its way to safety. Gray was next to go close for ‘Marine as he also got clear down the right channel, but fired his effort high and wide of Seabright’s near post as he broke into the box. Gray then played creator for McDonagh from the next attack as he once again shimmied his way past his marker on the right to cross for McDonagh who headed inches over the bar this time for what was almost an identical chance to the one he put away. Brad Hooper almost doubled the lead as Jon Else’s cross was partly cleared back to him and he took a touch to tee himself up on his right foot but his effort skimmed the top of the bar with Seabright beaten. Those missed chances proved costly as seven minutes before half time a long ball pumped forward looked comfortable for Michael Hopkins to deal with but with Calvin Brooks closing him down, his weak back header fell short of Kev Sawyer and Brooks stole into loop a header over him and into the far corner of the net. It was another disappointing and poor goal to give away as the sides would go into the break level. Ten minutes into the second half, Jake McCarthy tried his luck from fully 30 yards but his effort didn’t dip enough to trouble Sawyer. Marine responded by almost regaining their lead. McDonagh and Fleetwood played a lovely one-two in the corner of the area and McDonagh’s low cross was met by Gray sliding in, only to see Seabright once again deny them with a wonderful point blank save. As the game started to go end-to-end, the league’s top scorer Brandon Goodship had two chances to get his 11th of the season. Firstly he saw his effort from a well worked short corner routine cleared off the line before Sawyer made a flying save high to his right to deny him. The games real talking point came with fifteen minutes to play. Marine won a corner on the left which found it’s way to Ifil near the edge of the box, his header forward was met by McDonagh who volleyed past Seabright only to see the linesman on the far side raise his flag. Replays showed that McDonagh was at least a yard onside, (view the incident here) (sincere apologies for the bad language during the clip) however, the linesman had flagged against Matt Coupe, who was offside, but was clearly making no effort to go for the ball or to interfere with play. With three minutes to play, Seabright was called into action again. McDonagh swung over a delicious cross that substitute Ryan Campbell met at the far post but his downward header was superbly saved by Seabright, the ball rebounded to Hooper, who chested the ball down before volleying over from 8 yards. It was a bitter pill to swallow for ’Marine who had completely outplayed Weymouth and only been rewarded with one point. With the game in injury time Weymouth substitute Harry Baker kicked out at Hooper in an off-the-ball incident to receive his marching orders. Conor McDonagh scores our opening goal in the 10th minute…. View McDonagh’s magnificent volley rules out for offside?